Adorable sequel to Uni The Unicorn. Finally fans get the see Uni and the little girl from the first book get together all because they believe in each other. 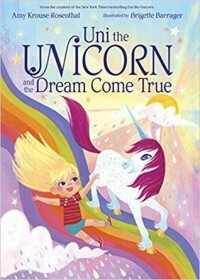 I was happy to see this continuation of Uni The Unicorn as the first book ended abruptly and without conclusiveness. Getting to see the little blonde hair-girl and Uni together was bittersweet as they saved the dreary skies and magicless unicorn world. Although the story is sweet it is a little too simple and yearns for more substance by the end. The story has so much potential but not unlike the first book it runs out of steam. While I still think this is a good book there are just things as an adult that rub me the wrong way but for child I do not think they would be noticed.